Cheap Weekend Fun in Boston for February 9-10, 2019! $6 Admission at Zoo New England: Now until February 10, 2019. Head to Franklin Park Zoo and Stone Zoo to celebrate 6 rings with $6 admission when you wear your (visible) Pats gear! Boston Travel & Adventure Show: February 9-10, 2019 at the Hynes Convention Center. Find your next travel destination + learn tips from experts for saving big on your next trip! Tickets are $12, but you can get free tickets (just pay service fees) through Goldstar Boston. Ragtime: This Weekend & Next Weekend at Wheelock Family Theatre: Enjoy this Tony-winning musical at Wheelock Family Theatre at BU. Discount tickets starting at $10 for select dates through Goldstar. Free Frost Fit: Every Saturday in February from 10-11AM at the DCR Hatch Shell. Enjoy a free winter workout series every Saturday morning for this new series! 2019 Lunar New Year Festival: Sunday, February 10, 2019 at North Quincy High School from 12-5PM. Celebrate the year of the pig with live music & dance, food, contests, family fun and more! Free admission and free parking. Lunar New Year Celebration at the MFA: Saturday, February 9, 2019 at the Museum of Fine Arts. Head to the MFA on Saturday for FREE admission for Lunar New Year! 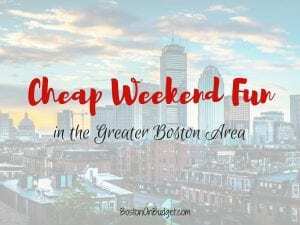 Cheap Weekend Fun in Boston for February 2-3, 2019! Happy (almost) weekend! Here’s a few fun things to do in Boston and beyond for SUPER BOWL WEEKEND!! 11th Annual “Some Like It Hot” Chili Cook-Off: Saturday, February 2, 2019 from 1-2:30PM. Join this fun, free and festive event in Harvard Square and vote for your favorite chili! Bank of America’s Museum on Us: Saturday and Sunday, February 2-3, 2019. Bank of America & Merrill Lynch cardholders can get into select museums the first weekend of every month for free by showing their bank card (per cardholder, not family). Museum of Fine Arts, MIT Museum and other museums across the state participate. Kid Price Saturday at Zoo New England: Pay and feel like a kid the first Saturday of this month at Franklin Park Zoo and Stone Zoo where everyone pays kids price for admission until noon! And Papagayo is once again the best place to catch the game if you need to watch it outside your home because if your team wins, you eat for free! You just need to make a reservation and be there at the start of kickoff. Hope you have a great weekend! GO PATS! Cheap Weekend Fun in Boston for January 5-6, 2019! Happy first weekend of 2019! Here’s the first Cheap Weekend Fun roundup of the New Year. As always, please let me know in the comments if I missed any fun and cheap events in the Boston area. Bank of America’s Museum on Us: Saturday and Sunday, January 5-6, 2019. Bank of America & Merrill Lynch cardholders can get into select museums the first weekend of every month for free by showing their bank card (per cardholder, not family). Museum of Fine Arts, MIT Museum and other museums across the state participate. If your anxious for snow, you may want to head up to Cranmore Mountain on Friday for their annual Ticket Rollback Day, lift tickets are just $10 on 1/4/19. I’ve been in my younger days and it was a really great and easy deal to take advantage of. Cheap Weekend Fun in Boston for December 8-9, 2018! Here are some fun and cheap things to do this weekend in Boston. As always, please let me know if I missed any fun and free events this weekend in the comments below. Mayor’s Enchanted Trolley Tour: Sunday, December 9, 2019. The third day of the Mayor’s Enchanted Trolley tour has been postponed to Sunday, December 9, 2018 with tree lightings across the city. SoWa Winter Festival: December 7-9, 2018 at 540 Harrison Avenue in the South End. Enjoy this makers marketplace with over 100 unique vendors and holiday gifts. Taza Chocolate Winter Warmer Weekend: Saturday, December 8, 2018 at Taza Chocolate in Somerville. Shop local vendors while sipping free samples of hot chocolate for some holiday fun! Free Photo with Santa at PetSmart: December 9-10, 2017 from 12-4PM at participating PetSmart stores. Bring the whole family (pets too!) to meet Santa and get a free photo too! The Enchanted Village Opens: November 17, 2018 to January 1, 2019 at Jordan’s Furniture in Avon. Relive wonderful holiday memories and start a new tradition with your family with this fun and free holiday display. Holiday Events at Bass Pro Shops: November 10, 2018 to December 24, 2018. Get a free photo with Santa with a Bass Pass + enjoy free holiday crafts and activities this holiday season at your local Bass Pro Shops!